BERLIN - Germany’s beleaguered president, Christian Wulff, announced his resignation yesterday after prosecutors asked Parliament to strip him of his immunity from prosecution over accusations of improper ties to businessmen. 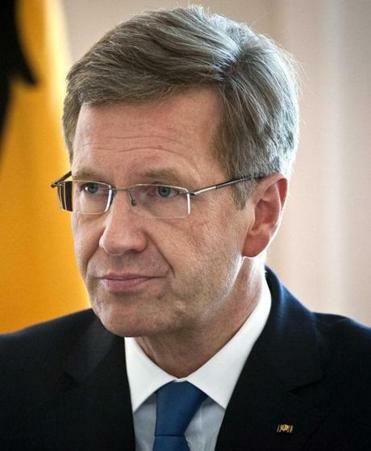 Wulff told reporters at Bellevue Palace, his official residence here, that he was stepping down because Germany needed a president who enjoyed the full trust of the people. ‘’Events of the past days and weeks have shown that this trust, and with it my ability to work effectively, have been persistently impaired,’’ he said. He was therefore resigning quickly to make way for a successor, adding that he was convinced the legal inquiry into his behavior would lead “to a complete exoneration.’’ The announcement brought to an end weeks of revelations over vacations with rich friends and a series of favors and freebies that may not have been illegal but were unseemly. The resulting scandal has become an ever-greater distraction for Chancellor Angela Merkel and her government in the midst of the euro crisis. Merkel, speaking at a news conference in the chancellery, said that her conservative bloc would hold discussions with the opposition Social Democrats and Greens in an effort to put forward “a joint candidate’’ to replace Wulff as president. Merkel will also meet with coalition leaders over the weekend to try to settle on a successor, German media reported. In the meantime, Wulff said in his resignation announcement, Horst Seehofer, the head of the Bundesrat upper house, would assume the role of acting president. Prosecutors requested Thursday that the Bundestag strip Wulff of his immunity from prosecution, saying that they had “factual indications’’ of long-suspected improper ties to business executives. The scandal first emerged in December with the news that Wulff, while serving as governor of the state of Lower Saxony, had taken a private loan from the wife of a wealthy friend worth about $650,000. Recent attention has focused on Wulff’s relationship with a film executive who was host to Wulff on vacations and whose company received loan guarantees from Lower Saxony. In his announcement yesterday, Wulff said he had behaved correctly. ‘’I made mistakes, but I was always honest,’’ he said.